Imagine with me…you get invited to a party or BBQ and the host asks you to bring an appetizer. 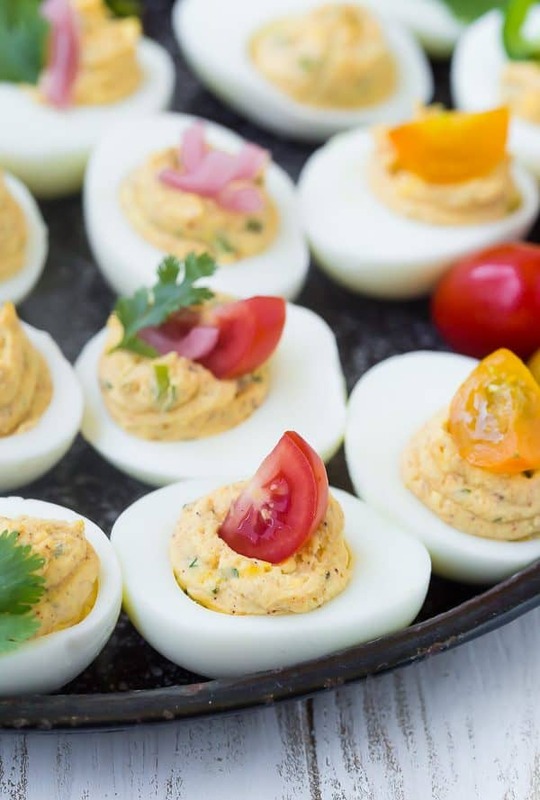 You know everyone loves deviled eggs, but they seem a little…dull. The usual. 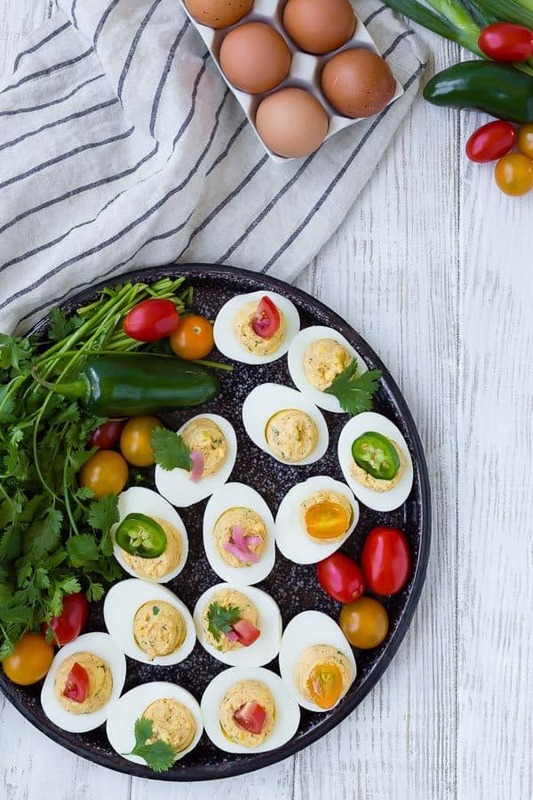 These southwest deviled eggs are exactly what you need. They’re easy to make, they’re a fun twist on a favorite, and they have toppings! You all know how I love toppings! Toppings are always the best part, aren’t they? 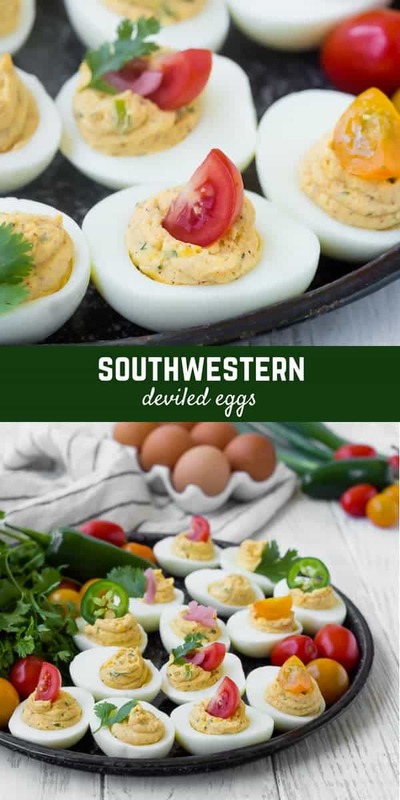 With these deviled eggs, you could easily do the same topping on each deviled egg, but I love using a variety of toppings so everyone can grab one with their favorite little nugget of flavor on top. 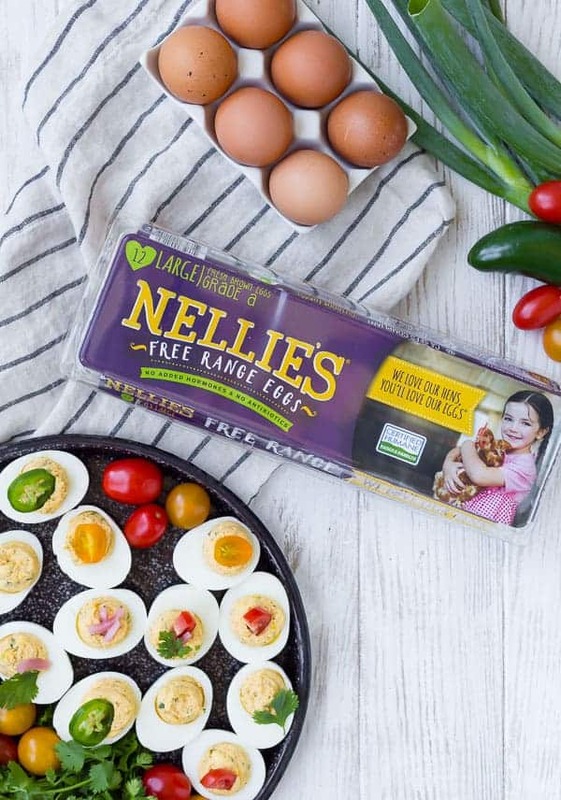 As you might remember, I’m partnering with Nellie’s® Free Range Eggs this year (remember the rhubarb Instant Pot cake?) and their eggs make the perfect deviled eggs. I eat a looooooot of eggs (I’d consider myself an egg expert! ), so I know there’s nothing better than a beautiful vibrant yellow-orange yolk of a free range egg. That’s important, since the yolk plays such a prominent role in a deviled egg. And it’s not just the color…they taste better too! 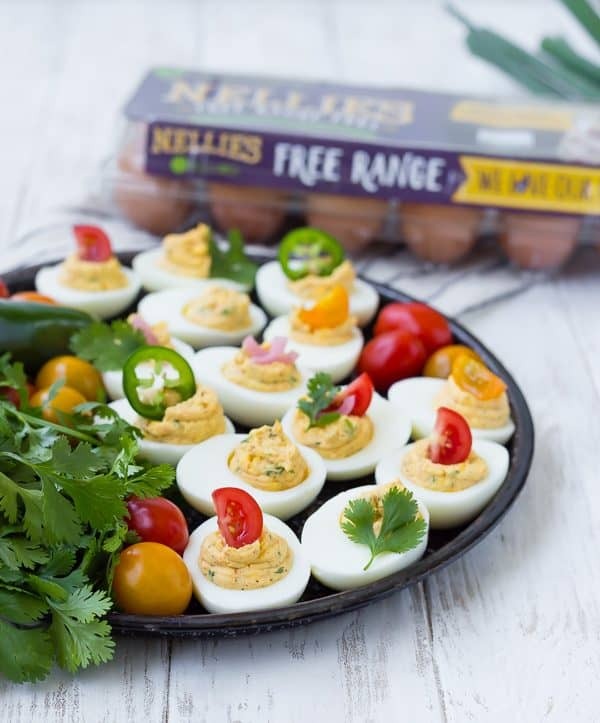 Nellie’s hens are all raised in a Certified Humane, free range environment. You won’t find any cages and the hens have access to the outdoors so they can peck, roam, and play in green grass. Their food is antibiotic-free and they have fresh water at all times. 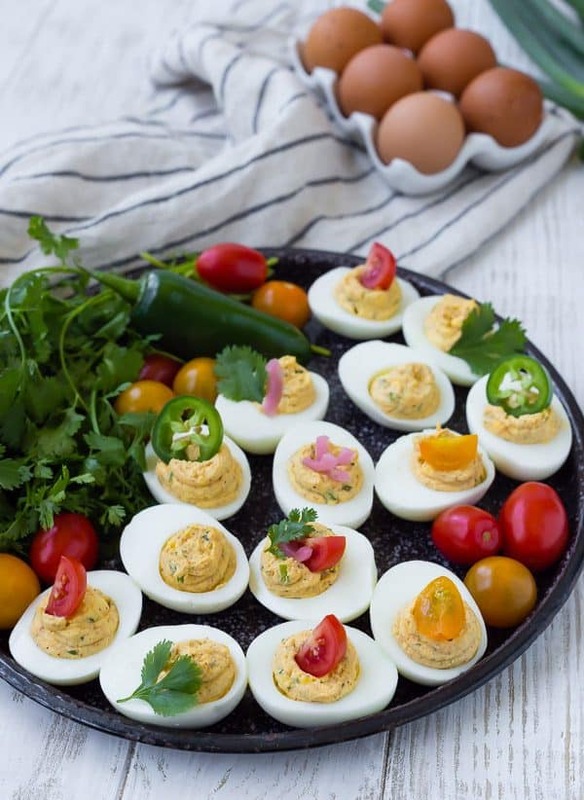 They’re the perfect eggs for these southwestern deviled eggs..and everything else. 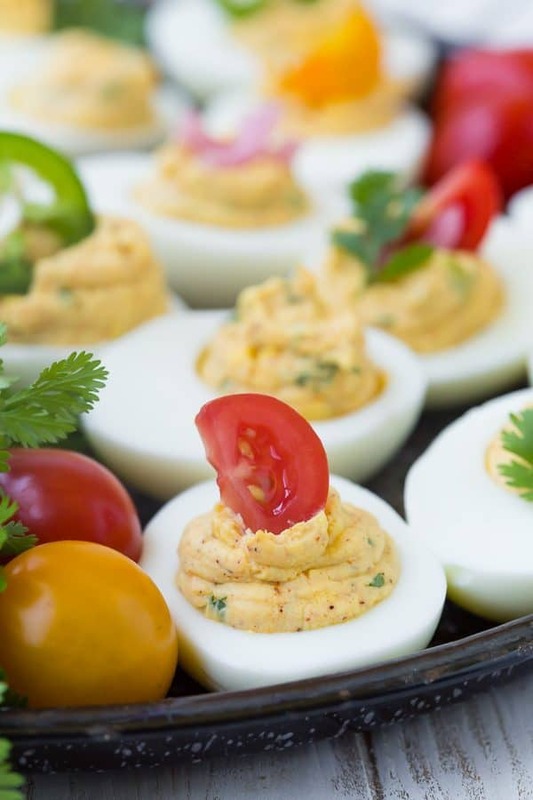 Traditionally, deviled eggs are made with mayonnaise and mustard. I lightened them up a bit by using a combination of mostly Greek yogurt and only a little mayonnaise. When I substitute Greek yogurt for mayonnaise, I typically leave in a little of the mayonnaise. 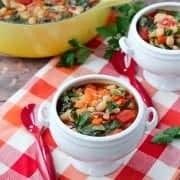 I find it smooths and mellows the flavor and also adds that familiar mayonnaise flavor that you’d expect. 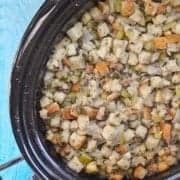 However, these have a lot of great flavor in them from all the add-ins and spices, so if you were to opt to use all Greek yogurt, they’d still taste fantastic. Speaking of add-ins….let’s talk about what’s in the yolk mixture! Tip: Make boiled eggs in the Instant Pot – they peel perfectly 99.9% of the time…it’s like magic! Smash yolks with a fork until no large pieces remain. Add yogurt, mayonnaise, and mustard. If it seems very dry, add a little more yogurt and/or mayonnaise. Garnish as desired. Best served immediately. Verdict: I loved the flavors of these! 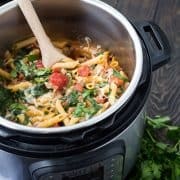 My favorite way to top them was with tomato, pickled red onion, and cilantro. 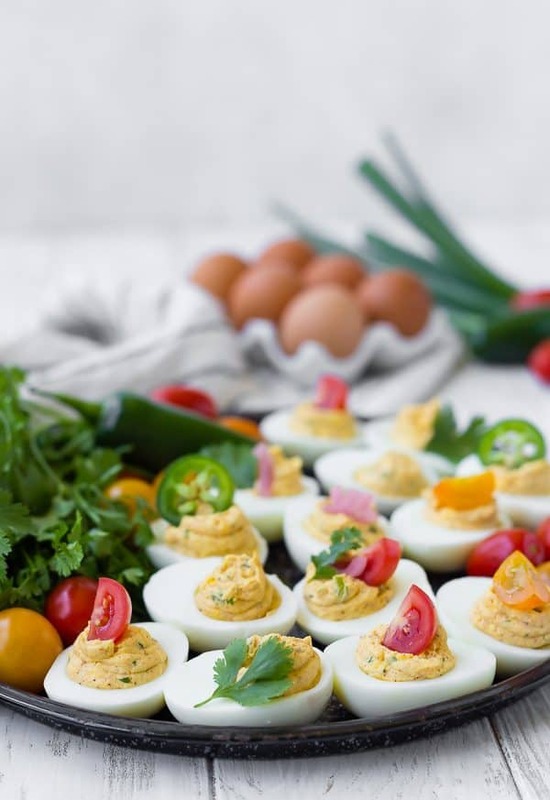 Husband’s take: Ben loves eggs…but doesn’t love deviled eggs….of any type. His loss! He does love it when we have Nellie’s eggs in the fridge, though! 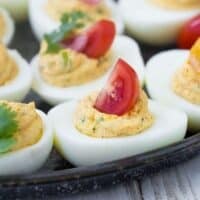 Changes I would make: None are necessary but if you’re a fan of relish in your deviled eggs, try chopping up some of the pickled red onions or adding chopped pickled jalapeño to the yolk mixture. Ooh, I like that idea for deviled eggs. I hardly ever get to eat them since I’m the only one to eat them. But, I would try this!